The corporate sector plays a vital role as employer and societal actor with regards to migration issues, but has hitherto been involved too little in the migration debate. Therefore The Hague Process on Refugees and Migration (THP) in the framework of its Business Initiative, organised for the second time a roundtable discussion on ‘Business, Migration and Mobility’ in the Netherlands, in cooperation with the European Commission (EC) and the Dutch Confederation of Netherlands Industry and Employers (VNO-NCW). In addition to representatives from the corporate sector, a number of governmental representatives, in particular from cities, took part in the roundtable discussion in order to facilitate a dialogue between these two important stakeholders in the migration policy field. In the roundtable report, the main conclusions, ideas and recommendations brought forward by the participants have been summarised. 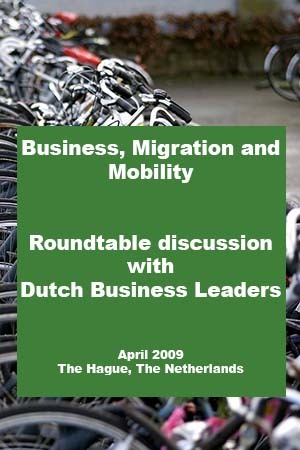 This entry was posted in Publications and tagged business, migration, Mobility, The Netherlands by THP. Bookmark the permalink.